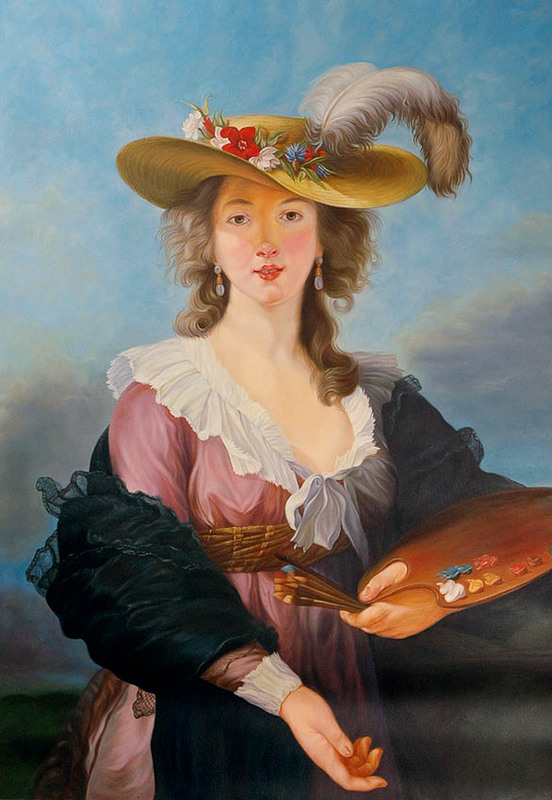 This painting inevitably places itself among the eighteenth century Rococo style with neoclassical subject at its end .This one is a reproduction of the French painter Louis Elizabeth Vigee Le Burn ,who was recognized as the most famous female painter of the time .It is a reproduction of “Self Portrait in a Straw Hat’ the work of one of most charming painters of the French school. What meets the eye is an upper class woman posing to be painted in a portrait . Done up in an elaborate way she creates quite a charming and captivating spectacle. Is it vanity that meets the eye? The fact that the lady is quite conscious of herself being enchanting and deriving pleasure out of it? Or sheer innocence? One almost feels like having had a glimpse into the secret of the heart that the lady dressed up impeccably projects. The artist sure succeeds in giving a characteristic attitude and expression in a nonchalantly pensive position. One can see feminine softness and delicacy as a predominating element in the work ,which can be seen compensated with excellence of undeniable flesh tones. The accessories have been done with admirable skill The portrait has been painted in a charming and graceful style with sobriety and a note of sincerity that was exceptional in the eighteenth century art of France. Above all what comes across as the most appealing aspect of the work is the element of universality that was the characteristic of nearly all the portraits done by the talented artist . Her portraits do not owe their beauty to the fact that they belong to any one special period, or because they bear the imprint of any definite epoch, but they are and always will be beautiful because of the universal truth they express. The truth of the human heart. This description by Bhoomika Jain.